Dr. He visited Nagoya University in Japan in December 2017 to promote collaboration on western boundary current dynamics and prediction. Just as the U.S. is adjacent to the strong Atlantic Ocean western boundary current called the Gulf Stream, Japan abuts the Pacific Ocean’s Kuroshio Current (see the post on Why Western Boundary Currents Exist). 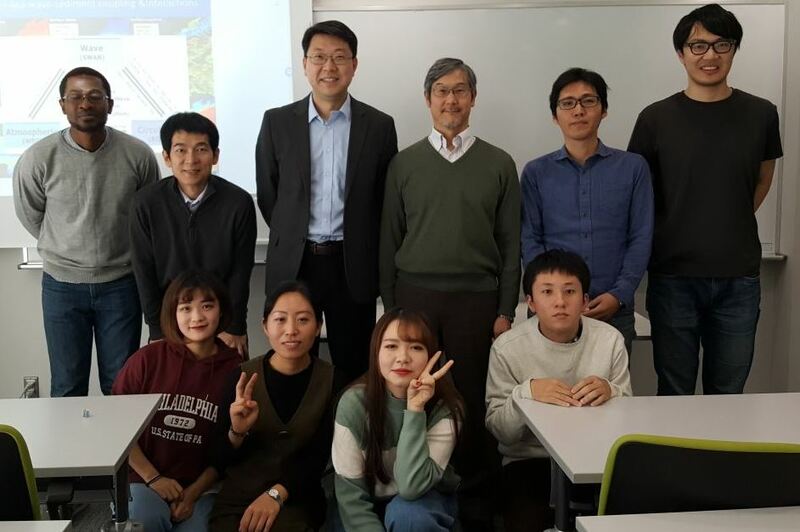 Nagoya faculty Professor Joji Ishizaka, Associate Professor Hidenori Aiki, and Assistant Professor Yoshihisa Mino, as well as post docs and graduate students, met with Dr. He. We are grateful for travel support from the Harry C. Kelly Memorial Fund for U.S.-Japan Scientific Cooperation. Faculty, post docs, and graduate students at Nagoya University with Dr. He. Back row, from left: post doc, Associate Professor Aiki, Dr. He, Professor Ishizaka, and Assistant Professor Mino. Others are post docs and grad students.